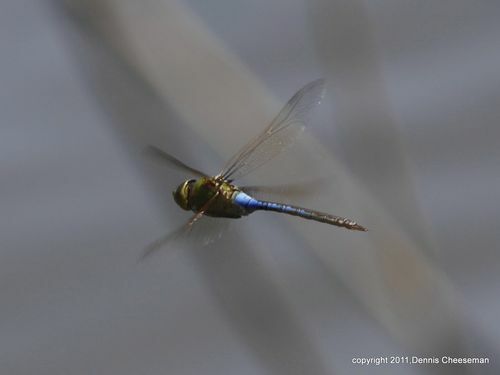 Dennis Cheeseman took this photo of a Green Darner Dragonfly in flight on DeKorte's Marsh Discovwery Trail. 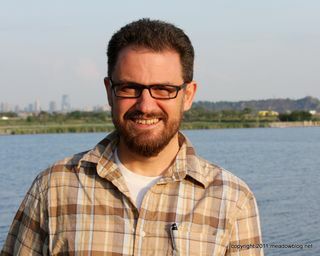 Tom Yezerski, author of the new children's book "Meadowlands," gave a great free talk last night in the Environment Center — discussing how the book came be, giving insights into the creative process, and sharing his love of the Meadowlands. Tom will give a free talk and slide show for children and their families on Saturday, June 25, at 10:30 a.m. We hope you can attend. Last night at dusk (8:30ish), two Black Skimmers were working the Shorebird Pool near the guardhouse. As far as we know, that was the first sighting of the year. Note: Sorry — In the above post I was thinking of DeKorte Park, where the skimmers can really put on some amazing aerial shows for all to see. This spring skimmers have also been seen in Harrier Meadow, by the legendary Meadowlands Marsh Hawks, as well at the Clay Avenue wetlands by Michael Mastropasqua. Thanks to the eagle-eyed readers who pointed out the error of my (hasty) ways. Pontoon Boat Season starts Thursday! 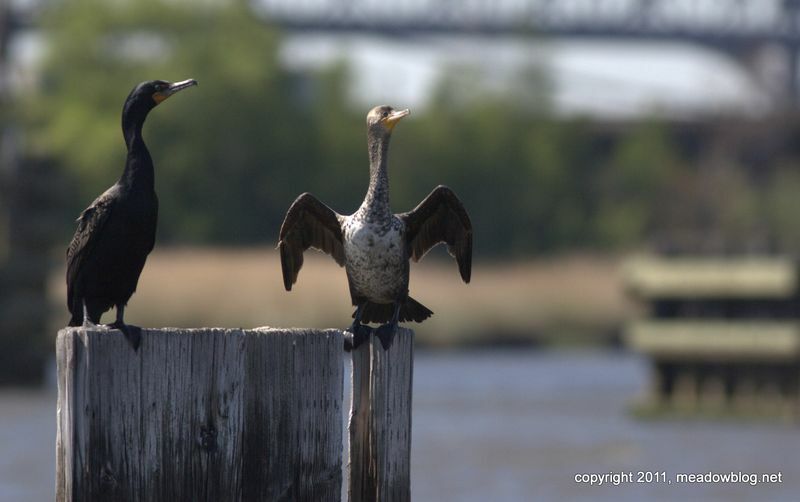 Beginning on Thursday night, the NJMC is beginning another season of guided boat rides along the Hackensack River and its marshes. 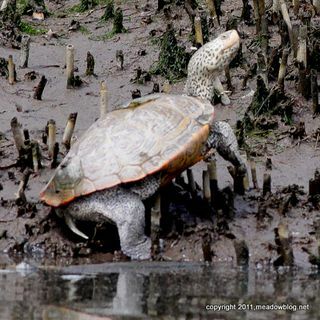 These inexpensive two-hour pontoon boat rides are a great way to see the hidden Meadowlands, full of birds and terrapins and Fiddler Crabs. We had a press preview of the eco-cruises recently, and the reporters had a great time (so did we). We saw a couple of Ospreys, a Bald Eagle, Yellow-crowned Night Heron, Peregrine Falcon and Diamondback Terrapin (photo at left was taken yesterday). The link to the article by Karen Zautyk in The [Kearny] Observer is here. The link to Tricia Tirella's article in the Hudson Reporter is here. The NJMC's Jim Wright also wrote a South Bergenite column about the trip, here. These trips are $15 per person for a two-hour cruise, and have to be experienced to be believed. 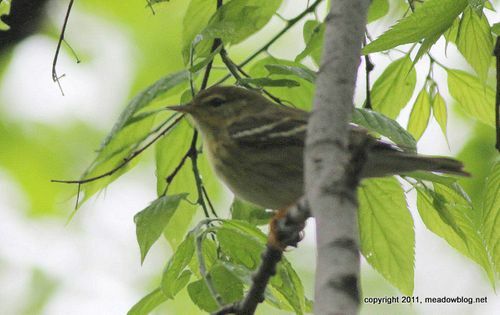 After photographed saw this warbler flitting from branch to branch near Teal Pool last week, we asked NJMC naturalist what he thought (in spite of the poor photo quality). His reply: female Blackpoll Warbler.